Venezuelan socialist dictator Nicolás Maduro was seen training with his armed forces and visiting air force grounds in a string of video posts on his Twitter, appearing defiant as the embattled leader attempted to galvanize his troops in the face of escalating international pressure against his presidency. In one Feb. 6 video, Maduro is seen training and doing physical exercises with a number of Venezuelan soldiers. The 30-second video starts focused on Maduro who appears to lift one arm up while marching together with the soldiers before the camera pans away to reveal the rest of the troops. “I am just another soldier in our dignified [Bolivarian National Armed Forces], ready to give my life, if necessary, to defend every palm of our sacred Fatherland,” Maduro wrote on the video post’s description. 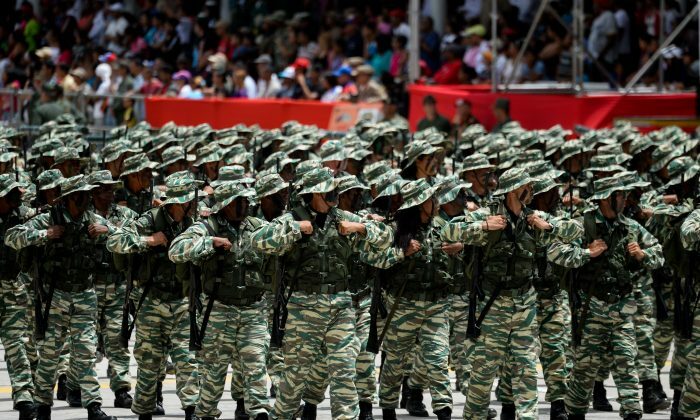 Maduro still has the backing of the military, despite new documents revealing that thousands of soldiers deserted him in recent years as the regime struggled to temper the erosion of its armed forces. His regime was already attempting to stem the tide of desertions before U.S.-backed opposition leader Juan Guaidó had called on the military to break from Maduro. Another video shows Maduro visiting air force training grounds and shaking hands with pilots. The post appears to be an attempt to eliminate fears of military abandonment after Gen. Francisco Yánez, a high-ranking Venezuelan air force general, broke with Maduro’s regime and sided with Guaidó. Jose Luis Silva, Venezuela’s defense attache to Washington and a key military official, said he also recognized Guaidó as the acting president on Jan. 26. Efforts from the United States to send food and medical supplies to Colombia’s border with Venezuela were prevented after the Venezuelan military blockaded a major highway link on Feb. 6. In response, U.S. Secretary of State Mike Pompeo urged Maduro’s regime to let the supplies through. Truck trailers and shipping containers were placed to block the lanes of the Tienditas Bridge on Venezuela’s northwestern border with Colombia. And two shipping containers and a fuel tanker were used to block a three-lane border crossing from the Colombian town of Cucuta. Venezuelan soldiers stood ready to turn away any humanitarian aid. Socialist policies introduced by Maduro and his predecessor, Hugo Chavez, have crippled the nation’s once-thriving economy. Almost 90 percent of Venezuela’s population live below the poverty line and over half of families are unable to meet basic food needs, according to the humanitarian group Mercy Corps. The UN estimates that by the end of 2019, there will be 5.3 million Venezuelan refugees and migrants.